The versatile 10-inch Sauté Pan with Lid features curved sides, which help retain moisture, making this a fabulous pan for simmering vegetables, braising baby artichokes, or even cooking breakfast grains. The versatile 10-inch Sauté Pan with Lid features curved sides, which help retain moisture, making this a fabulous pan for simmering vegetables, braising baby artichokes, or even cooking breakfast grains. The 5-ply stainless steel construction has an aluminum core for fast, even heat distribution, and the corrosion-resistant, non-reactive, stainless steel interior surface won’t alter flavors. 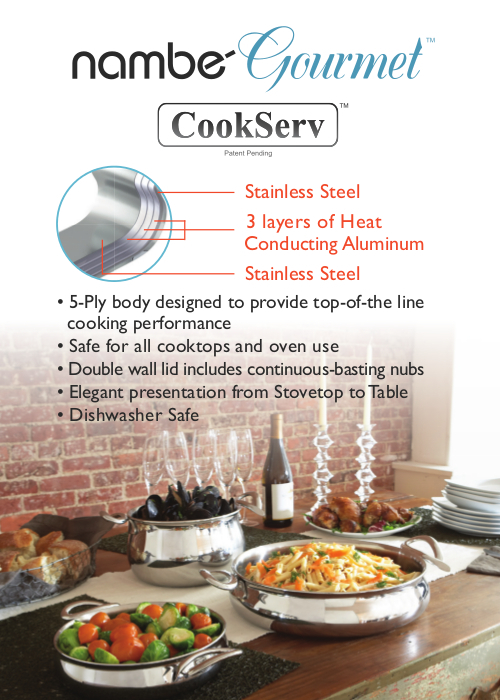 The exterior layer is composed of magnetic stainless steel—great for all types of cooktops. A fabulous Nambé exclusive piece that is attractive enough to be taken directly from the stovetop to the tabletop, where it can be used as a beautiful serving piece.